PAN also called as Permanent Account Number consists of a 10 digit alpha-numeric number. It is used as an Identity Proof and is issued under Income Tax Act 1961. The PAN Card is issued by the Income Tax Department under the supervision of Central Board of Direct Taxes (CBDT). PAN is one of the most important official document that every taxpayer have with them. PAN Card helps in carrying out high-valued transactions. PAN Card is also issued to the Foreign Nationals like investors as a subject to a valid Visa, unlike Aadhaar number and Driving License. The PAN is important for major functional transactions like opening a bank account, ITR Filing, receiving Taxable Salary, Sale or Purchase of Assets etc. Due to the heavy usage, there is quite a lot of chance to misplace or lose the card somewhere. A lost PAN Card can be very risky but the Government has contributed enough of the facilities to avail a Duplicate PAN Card. If you have lost your PAN Card then follow these simple steps to get it reprinted. Visit the official website of TIN-NSDL: www.tin-nsdl.com and go to the section “Online Application of PAN”. Now choose the option “Reprint of PAN Card”. This option is meant for the lost and stolen PAN Card. When you click on the link, you will be redirected to another page, where you need to click on the link “Online Application For Changes/ Correction in PAN data link”. Now, when you click on the link, you will be redirected to the page where the guidelines and instructions are viewed. Click Next after reading the instructions. Now you can fill in the application form. Provide the details like the Permanent Account Number Details, Name, Communication Address, Telephone Number, email ID etc. Documents such as photograph and ID Proof must be submitted along with the form. The applicant must submit it before the submission of the form. You can either submit the form online otherwise can post it to NSDL, along with the required documents. The payments are on the basis of your communication address, if you are staying within the country then you need to pay an amount of Rs 107. If you are staying outside India then you need to pay an amount of Rs 989. Accepts Net Banking, Debit cards, Credit Cards mode of payments if done online. If done offline then a demand draft is done for the payment. When your payment is successful, an acknowledgment number is provided along with the form. This acknowledgment number can be used in future to track down the application status. Then after, a duplicate PAN with the same PAN details will be sent to the registered communication address. The Government in the last budget introduced a new law which said that it is mandatory to link PAN Card with Aadhaar. The last date to link PAN with Aadhaar is 31st December 2017. Read here Complete procedure of How to link Aadhaar Card with PAN Card. The full form of PAN Card is Permanent Account Number. It is an official document. A PAN Card is a 10-digit alpha-numeric permanent number that is issued by the Income Tax Department under the Indian Income Tax Act, 1961 under the Supervision of the Central Board for Direct Taxes (CBDT). It is a unique identification number which performs as an identity proof. The card comes in a laminated form. The PAN card is accepted as a Proof of Indian Citizenship. The PAN number is an important document and it is mainly important to carrying out financial transactions and related activities. Some of them can be opening a bank account, receiving a taxable salary, sales, and purchases of the goods etc. The PAN Card holds the details of the citizen in a unique way. Receiving a PAN card takes an approx of 15 working days after applying for it. 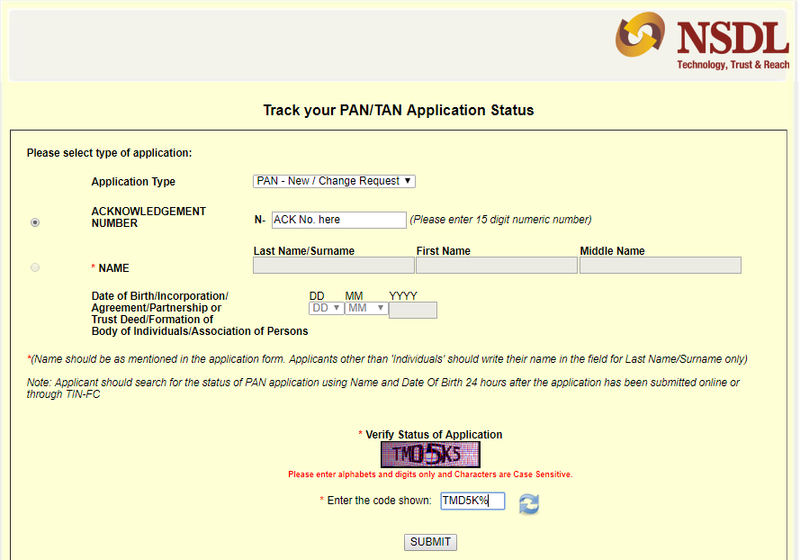 The Government has made it easier to track down the application status of the PAN Card. Hence to get an update on the movement of the application form of PAN Card, a 15-digit acknowledgment number is provided. Through this an individual can get the current status of the PAN. The applicants can track their application status by using a specialized SMS service. The individual must send an SMS in the following way “NSDLPLAN-15-digit acknowledgment number to 57575“. After sending the SMS, you will receive a current status of your application form. Here, the applicants can make a call in the call center and get the details of the current status of the PAN Card. The applicants can call on this number 020-27218080 to know about the status of the PAN card. The Applicants must log in to the official website for PAN, TIN-NSDL. Once you visit the page, navigate the PAN section on the website. In the page, you can find an option to check your application status. The applicant is required to choose the required application type -(New PAN Card or Updated Information) along with a few personal dates and a 15-digit acknowledgment number. After providing the following details the website will redirect you to a new page showing your current status of your PAN application. The applicant can track his/her application status after 3 days of filing the PAN application form. You may not find correct details if you track your PAN application status within 3 days. Online tracking of PAN is possible only for 24 hours after an application is submitted online. Thus, we found out that there are a lot of uses of a PAN Card. PAN Card has quite a lot of advantages. PAN Card also carry transactions which are the normal and high amount. So, you should make no delay to apply for a PAN Card. Question: How Can I know my Acknowledgement number of PAN Card? When you apply for the PAN Card you are provided with a 15 digit Acknowledgment Number, which will help you to track the status of your PAN Card Application. It will be sent to email when you apply online or will be on the receipt of your application when you apply offline. Question: How much time does it take for PAN Card? Usually. it takes 15-20 days for a newly generated PAN Card to arrive at your doorstep via Mail.